Discoveries in Israel now reinforce the view of Norman Golb that the Dead Sea Scrolls were not written exclusively or even largely by the Essene sect of antiquity, famous for its abstemious celibacy. 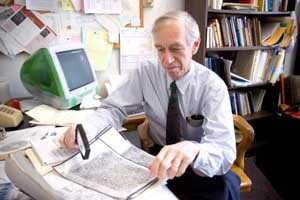 Golb, the Ludwig Rosenberger Professor of Jewish History and Civilization in Near Eastern Languages & Civilizations and the College, contends that the scrolls were the product of many hands and represent a broad range of perspectives rather than just the thinking of a tight-knit religious group. Excavations by archaeologists Itzhak Magen and Yuval Peleg now show that the inhabitants of Khirbet Qumran, the archaeological site close to the caves where the scrolls were found, were evidently not poor ascetics like the Essenes, but actually prosperous. Golb has long contended that the people inhabiting the Khirbet Qumran site in antiquity were not members of an Essenic or any other radical Jewish sect. The two archaeologists, both seasoned researchers, spent 10 seasons at Qumran conducting the most extensive excavations at the site in the past 50 years. They discovered jewelry, imported glass and expensive stone cosmetic containers, which were apparently part of a trade based on balsam perfume produced from plantations adjacent to the site, and on stone vessels manufactured there. Their findings add strong new voices to the chorus of archaeologists who, during an international conference at Brown University two years ago, pointedly questioned the original Qumran-Essene theory, Golb said. Haaretz, a daily paper in Israel, has recently characterized Golb’s 1995 book on the scrolls as pivotal in the steady emergence of new ideas on the scrolls’ origin and importance. Ever since the scrolls were first discovered in 1947, the Qumran-Essene theory—or as Golb has called it, “the myth of Qumran”—has taken on a life of its own and is still strongly defended by many. A Bedouin youth discovered the first scrolls in one of the caves and, as word leaked out, the find captivated the interest of people around the world. The scrolls include the oldest known copies of biblical texts as well as many other manuscripts, including some containing Essene views. The first scholars to study the scrolls, when only several were known, believed they were of Essenic origin and had been written at Khirbet Qumran. They based these contentions in large part on the discovery of several inkwells there, and of a cave scroll known as the “Manual of Discipline,” which described how a group similar to the Essenes was expected to conduct their lives. Only later, however, did it become clear that none of the scrolls actually espoused celibacy. Christian writers have been attracted to the mystique of the Essenes because of the connections they can draw between Essenic anti-materialistic beliefs and the teachings of Christianity, which discourage an interest in worldly wealth. The Essenes also espoused predestination, a belief adopted by Calvinists during the reformation in support of a biblical interpretation that some people are chosen by God for salvation, while others are not. Many Jewish scholars also have supported the Qumran-Essene theory. As a result, reference works still often refer to the scrolls as being the product of Essenes who lived at Khirbet Qumran. Golb, a specialist in manuscript studies, began to question this perspective over 30 years ago when he noticed the scrolls contained many different and even contradictory ideas. “Once the scrolls were published in facsimile over a decade ago, I could tell by the handwritings that at least 500 scribes contributed to the writing of the discovered texts,” Golb said. Furthermore, he said that no legal documents related to Qumran residents or other documents on the day-to-day activity of the people living at the site have been found. This suggests that texts found in the caves came from elsewhere and did not constitute a library of manuscripts produced at Qumran. He pointed particularly to the documentary Copper Scroll discovered in Cave 3, with its detailed descriptions of treasures and scrolls cached in many Judean wilderness hiding-places, as decisive evidence pointing to the various scrolls’ place of origin. This, as well as the large bulk of evidence that has accumulated now—which, Golb emphasized, the early researchers could not have foreseen—led him to infer that the scrolls were gathered in caves for safekeeping by the Jews of Jerusalem just prior to the Roman siege of 70 A.D.
“As the product of diverse writers representing a broad spectrum of ideas, the scrolls tell us very much indeed about the contemporary culture of the Palestinian Jews at a period marking a crossroads in world history and religious and social thought,” Golb said in the Tuesday, Sept. 21 San Francisco Chronicle.